A double amputee Army vet trekked the steep trail of the infamous Manitou Incline in Colorado all for the mission of veteran suicide awareness. This wasn’t the first time that 41-year-old Travis Strong made the journey but this time he made it in five hours instead of nine, to promote the veteran suicide awareness cause that he’s passionate about, according to Rare. Strong scaled the stairs using his gloved hands and perseverance. He made it to the top with shorts soaked with melted snow and his own blood. Strong said the trip was shortened since this time he made better preparations like bringing energy food and water. News crews were waiting below to interview him after his trek. 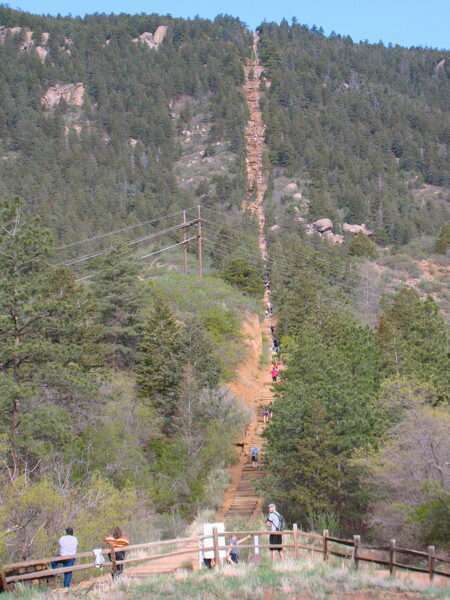 Manitou Incline is a 2,090-foot climb up 2,767 steps across a distance of .88 miles. He is one of only two double amputee veterans to make such a major accomplishment. The other veteran, who Strong says is his inspiration, is Mandy Horvath who mastered the Incline Gains and Pike Peak in the summer of 2018. Strong’s next goal is to make the trip twice in the same day and he wants to do it in the name of veteran suicide awareness. To do this he wants to set up “22 markers” on every 22nd step to represent the 22 veterans who die by suicide every day, The Tribunist said. #MondayMotivation – Now that’s STRONG! Travis Strong is an Army veteran who recently conquered the Manitou Incline’s 2,700 steps and 2,000 feet of elevation gain – as a double amputee. In 2006, both of his legs were amputated above the knee when an enemy projectile went through the Stryker vehicle and then through his legs while on deployment in Baghdad. Strong wasn’t going to consider himself disabled or even limited. Also in 2006, Strong called upon Cocoa Beach city commissioner Ed Martinez and asked him for surfing lessons. “Suicide remains a top clinical priority. One life lost to suicide is one too many. Suicide is a serious public health concern in the Veteran population and across all communities nationwide. These data offer important insights to help VA to build effective networks of support, communication and care that reach Veterans where they live and thrive,” said Acting VA Secretary Mr. Peter O’Rourke. A VA report states, “To prevent veteran suicide, we must help reduce veterans’ risk for suicide before they reach a crisis point and support those who are in crisis. This requires the expansion of treatment and prevention services and a continued focus on innovative crisis intervention services,” Military Times reported.